Since the 1870s, the Armed Forces have conducted live target practice on the shooting range at Ulven camp in Os municipality in Hordaland. In 2008, Norwegian Defence Estates Agency (NDEA) launched the efforts to clean up the 100-year-old pollution, and build new firing ranges with modern environmental technology. In June 2010 the new shooting ranges were handed over to the Armed Forces. “This project is in the process of setting a new environmental standard for shooting ranges in Norway,” says Bjarte Nesse, project manager in NDEA. When the shooting ranges were established over 100 years ago, few thought about the toxic effects of heavy metals such as lead, zinc and copper in nature. The metals, which are common in projectiles, are migrating with the rainwater into local streams and further into nature. In this project the streams have been piped away from the shooting range. In the shooting range of approx. 14 000 square meters, 9 000 cubic meters (or approximately 1 100 truckloads) of contaminated soil have been dug up, controlled and sealed under watertight membranes in the earth berms surrounding the the shooting range. Here the soil is stored dry and safe and no longer affect the environment. Usually polluted soil are being transported over far distances and handled in landfills, but here the soil is being reused. The large earth berms with the polluted soil in the core, double as a physical safety framework, ensuring that the use of the range is not posing any risk to the surroundings. A thick layer of fine, clean sand has been laid over the membranes, which will absorb new projectiles shot on the track. The new berms are built so that pollution of the surrounding areas is no longer to take place. As part of the new range-complex, a closed drainage system has been established, to collect the contamination that ends up on the ground or in the earth berms. The rainwater that flows through the sandy masses is cleaned through a large sand filter before it is released back into nature. “”A significant part of the total project cost is literally below ground,”” says Nesse. The project has as its goal that pollution from future shooting should not be spread to humans or the environment. 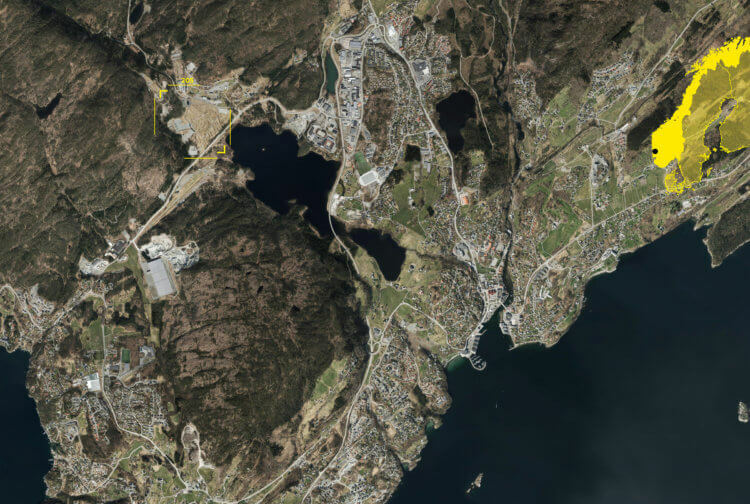 “This project is a pilot project for the Norwegian Defence Estates Agency (NDEA). Our good experiences from the project of rearranging streams, remediation of polluted land and the construction of bullet collectors with polluted masses as a core are experiences we like to share with others who will carry out similar projects. This project is helping to set a new environmental standard for shooting ranges in Norway” said Nesse. The new range-complex is designed specifically to optimize the safety conditions so that it became possible to place the three individual ranges closer to each other. Complicated simulations and calculations of the various shooting activities’ safety footprints have been conducted, and as a result of this screens, walls and berms have been installed in the landscape to design an optimized safety footprint. This has enabled a very compact facility where the different paths can be used simultaneously or separately in complex exercises. The overall design of the range-complex operated by 3RW arkitekter has required handling of several safety and HSE related regulations. The facility is designed according to the requirements set by the Armed Forces Security Guidelines for training with live ammunition (UD 2-1) and NDEA’s own manual for the creation of shooting ranges. Coordination between professional environment at both Norwegian Defence Estates Agency (NDEA) and the Armed Forces Research Institute (FFI), and the environmental authorities has been necessary to quality assure the design process along both the environmental conditions and safety. In 2011 the project was nominated to the NDEAs architectural award, as the first training facility to ever be highlighted in this context. The leader of the Jury, Prof. Arch. Karl Otto Ellefsen, states in the nomination document; “The project has a high level of innovative solutions, a distinct architectural expression, and high sculptural qualities. The facility is a rolemodel for other firing ranges”.